That spoonful of jelly, jam or preserves can be up to 70% sugar and so sweet that the first thing you taste is table sugar, not fruit. If you’re trying to cut back on sugar, switching jam and preserves is one place to start. 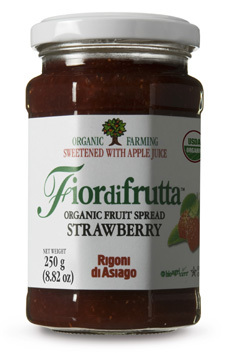 The producers of the Fiordifrutta (“flower of the fruit”) line of no-sugar-added jams (actually fruit spreads*), imported from Italy, say that they “work with nature” to produce their products. *Per U.S. Food & Drug Administration definitions, a jam or preserve sweetened with something other than sugar is called a fruit spread. The taste is right from nature. It’s as if you picked and cooked the fruit in your own kitchen, modestly sweetened with apple juice. The only ingredients in the jar are organic fruit, organic apple juice and apple pectin, resulting in about 30% fewer calories than conventional products. The 100% organic line works with nature in a second way: Organic agriculture is sustainable agriculture. By choosing an organic product, you help maintain the environment for your family and for future generations. You can enjoy Fiordifrutta in apricot, blackberry, cherry, cranberry, lemon, orange, peach, plum, raspberry, strawberry, wild blueberry and wild berries. Spread away: on bread, with cheese, as a dessert or pancake topping, in sauces, in smoothies, in plain yogurt. The suggested retail price is $5.99 per 9.52-ounce jar. All of the flavors are available online at SelinaNaturally.com. Or, phone the importer at 1.305.470.7583 for a retailer near you. One note: Since the fruit spreads are organic and made without sugar, there is no preservative—natural or otherwise. Thus, the shelf life is shorter than other jams in the fridge. Enjoy your Fiordifrutta within 6 to 8 weeks of opening. Most people won’t have to worry about this: The jar will be empty within a week or two. Apart from the fruit spreads, Nocciolata chocolate and hazelnut spread, an elegant version of Nutella, is a must-try. According to the company, Nocciolata contains 15% more hazelnuts than Nutella. See more of our favorite jams, jellies and preserves in our Gourmet Jam Section. What’s the difference between jam, preserves, marmalade and the rest? Check it out.